Timberlake Rnach covers approximately 7,000 acres in New Mexico’s Cibola and McKinley counties. It is nestled in a valley surrounded by the Cibola National Forest (342,000 acres.) 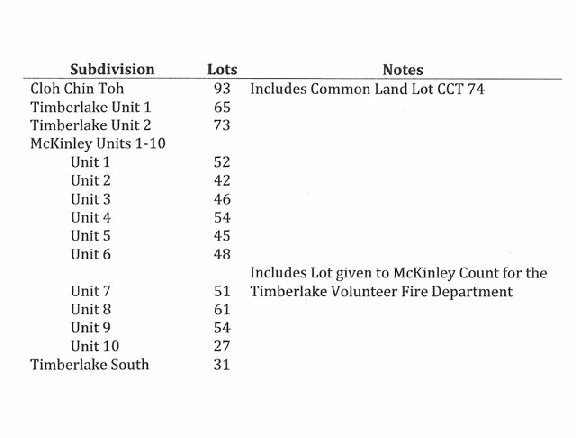 There are five subdivisions: Cloh Chin Toh, Timberlake (Cibola) Unit 1, Timberlake (Cibola) Unit 2, McKinely Units 1-10, and Timberlake South with a total of 743 lots varying in size from five to fourteen acres, the majority being just over 5 acres in size.